Today only you can get the Nespresso Citiz on sale at Amazon, $76 off. I have one for my little class B and love it. A bit pricey but the coffee and convenience is great. I found a wonderful coffee maker for $20 at walmart. It takes pods or grounds. It makes a single cup in around 5 min. 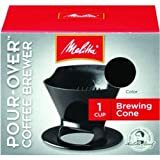 it is a "Mainstays Single Serve and K-Cup Brew Coffee Maker." We got one for the house and one for the RV. As we boondock over 90% of the time and only have a single LA battery we would have to start the genny to run an electric coffee maker. I've converted to using the pour over system at home. I enjoy the coffee and the ritual of making it, including freshly ground beans. I make a 20oz cup, usually. Same here, Steve, and for the the same reason. That and it makes an excellent brew in combination with freshly roasted and ground beans. When you’re on the road it’s fun to try out local coffee roasters. I may start focusing a bit on different local roasters. Up to now I've been investigating micro brew pubs, and really do enjoy the wonderful variety and atmosphere associated with them. Even better at Walmart for $8.88 and it only draws 700 watts. It works great on a Roadtrek 750 watt inverter. I checked that out cuz it would seem cool but it says the water only gets heated to 170*F. The recommended temp for brewing is 195 to 205. That being said, it's still a frugal electric possibility. I would wonder if a person could preheat the water to get a higher temp if it a thermostat would restrict that. Specs say "Coffee temperature equal or above 77 degrees C", so there is no telling how hot it really gets. Correct Temperature is one reason pour-over coffee can be better than inexpensive coffee makers. My bad. I would ASSUME that preheating the water may get the brewing process hot enough, maybe? I'll just stick with my pour over, easier, freshly ground coffee and more frugal. Plus, I have only a 300 watt inverter. Thus far I've had no reason to get a larger one. I've also heard good things about the Aeropress. I tried a French press and didn't care for the clean up involved. It is now sitting on our shelf for "things that collect dust but look kinda cool" high up in the kitchen.